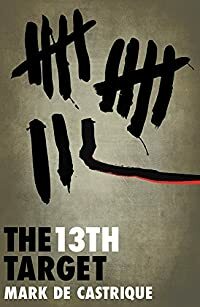 The 13th Target by Mark de Castrique, a Mysterious Review. Review: Ex-Secret Service agent Russell Mullins, now an employee for a private security firm, is shocked when his client, Paul Luguire, the liaison between the Federal Reserve and the US Treasury, is found dead, an apparent suicide. Mullins doesn't believe it was suicide, and takes a leave of absence to prove otherwise in The 13th Target, a stand-alone mystery — but also possibly the first of a new series — by Mark de Castrique. Amanda Church, who now works with the Federal Reserve and is a former colleague of Mullins from his Secret Service days, agrees with him and they team up. She has discovered that Luguire's name is tied to a number of improper transactions that moved money between banks, and ultimately disappearing. Another name linked to the transactions is that of Mullins himself, who she learns has a secret bank account in the Cayman Islands. But of course he doesn't. Still, a third party has gone to a lot of trouble to set up Luguire and Mullins. If that third party has killed Luguire, it's only a matter of time before they come after Mullins, tying up loose ends as it were. Church and Mullins pursue separate leads that all seem to point to the same scenario: a coordinated terrorist attack on the twelve regional banks of the Federal Reserve … and a thirteenth target, the Federal Reserve headquarters in Washington. The 13th Target has a sort of "ripped from the headlines" feel to it, which can be tricky, especially when dealing with a political scenario, balancing known facts of a given event or situation with conjecture, commentary, interpretation and ultimately opinion and/or bias … the latter of which there is gratifyingly little to note. The author does a fine job here of creating a realistic backdrop to the story while basing the primary plot firmly in the fictional world. There is a reasonably large cast of characters, each with their own point of view, but only a half-dozen or so have major roles. It seems clear early on that readers aren't being given the full story behind any of the characters, infusing each with a shroud of mystery as to their intent. Which side are they on? Are there "sides"? And is there a "good" side? There are a lot of details that are cleverly worked into the plot, some of which seem unusual when first referenced, only to become key points later on. It might be tempting to label The 13th Target as a "political thriller" or "financial thriller" but either of these terms would be too limiting and largely inaccurate. It's a solidly plotted and well crafted whodunit-style suspense thriller at its core; the financial and political elements simply make it topical. Acknowledgment: Maryglenn McCombs Book Publicity provided a copy of The 13th Target for this review.